This fascinating and shocking history of the rise of the Nazis draws together a multitude of expatriate voices—even Charles Lindbergh and Samuel Beckett—into a powerful narrative charting this extraordinary phenomenon.Without the benefit of hindsight, how do you interpret what’s right in front of your eyes? The events that took place in Germany between 1919 and 1945 were dramatic and terrible, but there were also moments of confusion, of doubt—even of hope. How easy was it to know what was actually going on, to grasp the essence of National Socialism, to remain untouched by the propaganda, or predict the Holocaust? Travelers in the Third Reich is an extraordinary history of the rise of the Nazis based on fascinating first-hand accounts, drawing together a multitude of voices and stories, including politicians, musicians, diplomats, schoolchildren, communists, scholars, athletes, poets, fascists, artists, tourists, and even celebrities like Charles Lindbergh and Samuel Beckett. Their experiences create a remarkable three-dimensional picture of Germany under Hitler—one so palpable that the reader will feel, hear, even breathe the atmosphere. These are the accidental eyewitnesses to history. Disturbing, absurd, moving, and ranging from the deeply trivial to the deeply tragic, their tales give a fresh insight into the complexities of the Third Reich, its paradoxes, and its ultimate destruction. While there have been countless books written about the rise of Hitler, Travelers in the Third Reich relies on firsthand accounts by foreigners to convey what it was really like to visit, study or vacation in Germany during the 1920s and '30s. Throughout, Boyd draws on contemporary letters, diaries and memorandums written by diplomats and politicians, college students, social workers, famous authors and Englishwomen married to Germans.... As Julia Boyd emphasizes, too many people allowed reverence for a nation's glorious past to warp their judgment about its morally repugnant present. That's a lesson still worth thinking about. 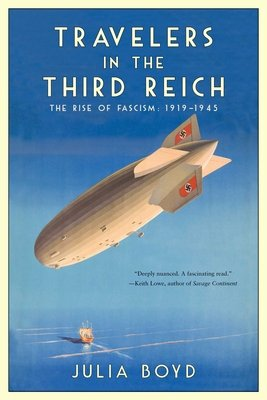 Drawing on fresh sources, Julia Boyd's "Travelers in the Third Reich" (first published in Britain) shows the extent to which reactions to the regime varied, both over time and as a function of ideological proclivities, relative sophistication, and specific itineraries.... Much of what Boyd tells us isn't exactly news... But her travelers highlight more surprising aspects of the regime as well.... Sometimes Boyd's research unearths intimate anecdotes. Boyd's book distinguishes itself not only for the breadth of its investigation but also for the palpable tone of frustration that runs throughout. Historians are professionally wary of hindsight, and Boyd never blames her subjects for not knowing the future. But even so, her moral outrage is often obvious.... [R]eaders will likely share Boyd's quiet outrage that more Germans didn't see  or weren't willing to admit  what was happening right in front of their eyes.